I just finished implementing a technique Blocked Clause Elimination (BCE). The idea is that for a literal l and a clause C containing l if for every C' clause R = C ⊗l C' is a tautology (where ⊗l is the resolution operator on literal l) the clause C can be eliminated. The removed clause C is said to be blocked on literal t. You can check Mate Soos' post on the same topic. My implementation is pretty fast since it doesn't run BCE until completion, but it iterates over the literals and tries to find clauses blocked on that literal. It also doesn't handle dependent variables (i.e. variables that appear in exactly one XOR clause) or pure literals (literals that appear as a single phase). The graph below compares the performance BCE. begin - before reasoning first time. 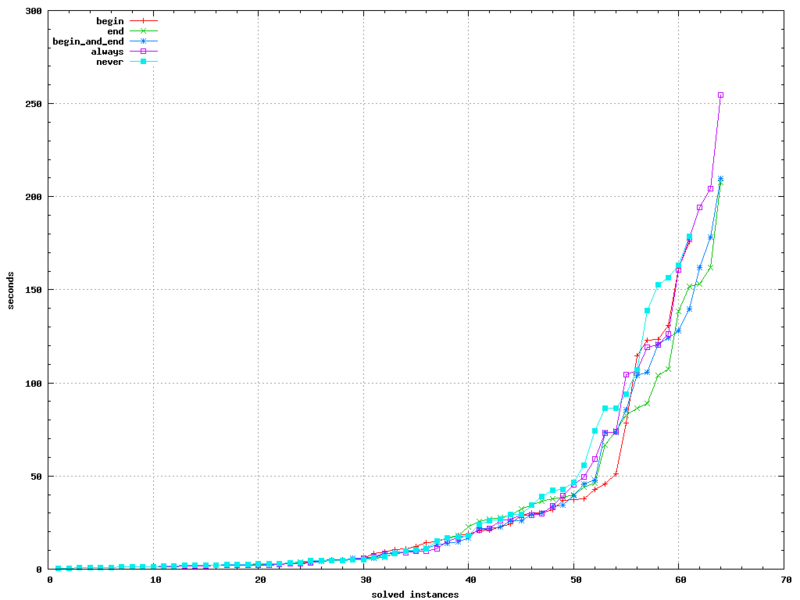 Should speedup first node evaluation. end - after reasoning first time (just before branch). Should find more blocked clauses. always - at every node of search tree. Should discover new blocked clauses from propagating branching. I expected that begin_and_end was at least as good as end, but it was not the case. 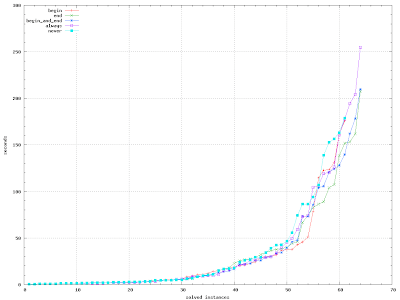 It seems that doing BCE before first node evaluation slows down search on instances from the AProVE class. BCE is stronger than pure literals and dependent variables eliminations, but the later two eliminate most of the benefits of BCE. BCE after simplifications is able to find many clauses that are not already eliminated by other techniques and this is why end in the above graph shows the best performance.